Miffy loves tucking into a pancake covered with her favourite toppings, but the best part for Miffy is flipping the pancakes high into the air! It’s nearly Halloween which means only one thing… pumpkin pie! 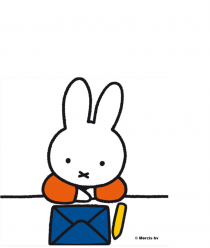 Melanie is coming over to play later this week so Miffy has made her some tasty treats to enjoy. Yum! Miffy’s been baking with her friend again and this time they’ve made Miffy ice cream and fruit parfaits, perfect to cool you down in summer.